2 dozen patterns shown in full color for delightful fused glass wind chimes, window charms and mobiles. Colorful and easy to make using scrap glass, bottles, driftwood and wire - plus they sound great! Step-by-step instructions. Full of how-to photographs, illustrations and stencil patterns. 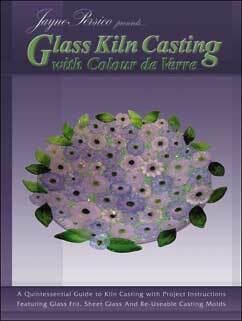 Covers both wet and dry enameling laminating and slumping glass, kiln firing and annealing. A great overview of wet & dry enamel techniques.